Jubhshled by cdutkority. Ti-li SD Y. 2r;i ,JULY, 1956.
t is he rby u il' ed l it'' g n' r'a iniformation that His Excellen y the (overnorl has issued a (Commissio a to P. 1). iMACDONALD, T'q., (C.M.O.. appointing him to) e Go e' rs Depty. d~I ing his absence from Ant. a wvhilst visiing Mon'sIt rat from the (t t h; 18th August, 1956. It is hereby notified for general information that consequent upon the defedirlation of( the Lve'vard Islands on the It July. 1i;, Mr. D. H. A. MdcNamara. Magistrate. whoI, acted as Crown Attoirney, Antigiia, up to and iniciludingl thile 30th Jlune, 1956, has been appointed acting Legal Assistant, Antignta. I U der the prvi ions of Seetion 4 of the Rent Restriction Ordinance, No. i3 f 1917, the Administ ator of Antigua has b1en pleased to> appoint with effect from the 26th March,. 1956. Donald Sheppard, Esq., to be a Rent Commissioner for the Colony of Antigua. The' Secretary of State for th,: Colonies has intiornied(i the Governor that the power of disallowantce will not le exercised in respect of the undermentioned O)dinances:- II Z / ii I . No. 9 of 1955, P'rotection olf Trees and C(onservation of Soil and Water (Amendment) Ordinance, 1955.'" No. 16 of 1955. The Motor Vehicles (Amendment) Or'dinance, 1955." The following L !Hiils which are t) be introduceed in the Legislative ('uneil of Antigua, are circulated with this Gazette and forin part t:hereof:-" Thie Distribution o f Germnan Eneminy Property Ordinance, 1956." " The Currency Act (Amendment) Ordinance. 1956." " The Interpretation and General Clauises Act (Amendment) Ordinance, 1956." No. 31 of 1956, The L gislative Council (Reimue-ration oi! Election Offeers) Regulations, 1956." No. 27 of 1956, "' The Pensionabhle Oflices Order, l56." 3 p!i. Price 6 cents. The Index to Vol. LXXXIII of the Leeward Islands Gazette for the year 1955, is circulated with this issue. [)iallo etized it ( v't. 14 THE ANTIGUA, MIt()N SRi .N. D i il, IN ISL, NDS GAZETTE [Ju, :2. 1 ,0. Ref. No. 24 13 0749. NOTICE 1IS TIEREBY that it appears to the Gov Council thaIt the lands desc the Schedule hert U and si Monte'os Estate' inll the ; Saint MAry iln the Ilanl of are ly to be needed for which in the opinion of t!e G i Cinud a1re ll iie purposes to e't th Schoml, A it is necessary to x k- a >e c',''N (of th Sid hlnd. separating it from the remainder of Monteros Estate. IDated the 21th day of June, 19)56. Clerk of the Coun, il,. NOTICE IW HEREBY (1IVEN that it appears to the (ovenor ill Council that the lands described in the Schetdule beret and s-'ituate at Not Gr vY, in t Pai' h of John in t]e Ishnn of Antiqua re likely to e niee4ed f"r ppo es whi h1 in the op)miion o4 f th Govenor ii Cou cil areo puji0 "u'!ts unInely I'" Frt therneon a h'l,! A[D that it is neeessaor to ;make a 'preiminary sirvey O w t!i s i 1l 'd. 174474;'0 in, a0 e om' .i1 '.t1ely 2.MG ac '"4 at Enut .t No1t Grove iln thei' Pish :t.
O) the West by a road. ND. Dated the 26th day of Jnll-. I9G56. ernr rtSt. ohn,/'s, A ,ignda. 1The pst is n'>usionaide (and the, a1 iltilent w''ill 11e on tractt for three (3) yer's. The salary is in the scale of 1,0)0-41,200) per anmm, and the salary of the scceessful candidate will depend on his qualifications and experience. The Officer will be subject to the Colonial Reguianis and local General Orders for the te being in force in so far as tiwy are aplyicobl. A Travelling Allo'an1ce f 1 pI r) a'nnuin4 will H pad Ir'oTvid 4t',e Miileer maitains S44t4 Xr ioid 1ir thie perforniance of his ieieial duties. The dutis of the post are to direct and supervise work in c(onn(ctionl with the Islads RWad Proramnme. Th untin works involve the design, layot and mcnstll(tionl of nIw seetims of road, and the colas surfacing of existing granel roads. ('ivil Enginee or sihoid p.'o s the A.,LC E. qualiW vtios o enmparable experience mI goalitoians. 'iree passages oll first appointment and oni satisfactory completh,in of the period of engagement will be provided (1,' the Of'icer. his wife and children ot ext eding five persons in rll: bildren s,,od be in4uier 18 years of age, niunarried anl dependlIt on thei Offlcer. Vacation leai' will i1e ,ralnted on the satisfacetory termination of the tractat at the rate of I week for each conleted period of 3 months consecutive e service. All G(overunweut Oflicers are liable to taxation impoNsed by local !egislation. Applications giving full particulars, n'litieon4, -' an~did experielic' of the applic11t and ac'coimpanied by two testimonials, should be addressed to the Chief Secretary, Windward Islands, (renada. and must reach him not later than 15th August, 1956.
. 1. I1'M 5. M .
1. At the beginning of the Hurricane Season the public are advised to take precautions to safeguard their hones and other property in the event of a storm. During, a hurricane the central electricity supply will be turned off,. and every household should therefore bo provided with a hurricane lantern or a flash light (or preferably with both) which should be checked regularly and kept in working order throughout the hurricane season. 3. The masters or agents of vessels if in doubt should ei litaicate wii the Harbour Master for information. the direction of the prevailing- wi-d, which varies fromn Nortih \West to North Vas. Should the centre of a storm pass over the island t here wi ll e a )rt period of cair (l ring which the Northern side of the building, could be opened up and the Souther and Westry sides closed. Very oflteu there is in) ecam, nd undmler such circumsnanmcs it is wise to hav e v'r~yting securely fastened. Stat ion. .Frequaency D)al!/il ly rather 6A(cial hurricane trarms. .
WIPR 940 k-s 8 0 .. 3 a.m.
(319.14 n) 4 55 .m." 12.30 p.m.
WAPA 680 t-s 7A5 a-. WKAQ !n km 130 p.m.
(i 7.21 in) 12.30 nA. .
Windwv:o,-d 3,nol ): 51.s 7.10 p.m.
mi NW an In illAls. :.ely todet island of Antia -( \ET ADVISD. i. 10 red 0.4s, with black tquars in centre-HIRRiICA\NE S (,i NALDAG-ER EXPECT ED. AT DAY & AT NI1 H.
A il LW~ iT I ill Ibe 1di ayed ati PLi.e Brtions. i>,i, will : hr h St.
John's Ord Vil es n ul 'in' th.r M &histles. St. John's, ni n o.
PriM at -h o Goernment Printinv Office. Antiina, Leeward I ands, by IARL IPIGoTT, Actimtr Government Printr --lI;v Authority. Enemy Property in the Colony in an Administrator and for the distribution thereof. Distribution of German Enemy Property Ordinance, 1956. ANTIGUA. 2 Distribution of German No. of 1956. No. of 1 956. Distribution ol German 3 ANTIGOVA. (iii) shipping freight, rebates or fares. No. ot 1956. Distribution of German 5 ANTIGMA. (3) For the purposes of this Ordinance, property which, or the right of transfer over which is vested in* any custodian of enemy property appointed under section 9 of the Trading with the Enemy Ordinance, 1939, and property which, by 12/190. virtue of any order made under the said section 9, cannot be dealt with without the consent of the Governor, shall be deemed to be subject to control under the said section 9. Trading with the Enemy Ordinance, 1939, shall be 1211939. construed as a reference to that Ordinance as amended by or under any other Ordinance. Administrator of German Enemy Property (hereinafter in this Ordinance referred to as "the Administrator "). 4. (1) All German enemy property on the Property to appointed day in the hands of the Custodian shall nst in vest in the Administrator. tor. (2) The Governor may by Order vest in the Administrator any other German enemy property situate in the Colony or the right to transfer the same. Any order so made shall be sufficient as respects property of any description to vest in the Administrator any property or the right to transfer any property as provided by the vesting order without the necessity of any further conveyance, assulrar ce or document. (3) A vesting order made in accordance with the preceding subsection may be varied or revoked by the Governor. (a) to anv claim in respect of a Cernian Claims. A.NTIo UA. 6 Distribution of GeT(rmali No. of 1956. No, of 1956. Distribution of German 7 ANTIGUA. Provided that in the event of the death, bankruptcy, winding up, mental incapacity, or absence from the Colony of any such person "or insurer as aforesaid the claim mqy be made by any person authorised by him in that behalf or by any person entitled to deal with his property. Ordinance shall be made to the Administrator within three months from the appointed day or such further time as the Governor may by Order made either generally or in relation to any specified class of claim direct. (3) Claims shall be made on the appropriate form prescribed by the Administrator and shall contaiD the information required on the form and 'shall be accompanied by such documents as may be so required. possession or control as the Administrator may require for the verification of the claim. of this Ordinance and the amount for which it may claim., be admitted for payment, and shall serve written notice of the determination on the claimant. Provided that the clalmant, if dissatisfied with the determination as being erroneous in point of law, may by notice in writing given within six weeks after being served with notice of determination as aforesaid and setting out the question or questions of law in respect of which it is alleged that the determination of the Administrator was erroneous, require the A dministrator to state and sign a case for the opinion thereon of the Supreme Court and the decision of the Supreme Court shall be final. general revenue of the Colony. meant. date to be appointed by the Governor by Proclamation published in the Gazette. vesting in an Administrator of German Enemy Property of such German Enemy property in the. St. Vincent Bill are attached. S.1. United Kingdom Statutory Instrument 1951 No. 1899. G.E.P.A. United Kingdom German Enemy Property Act, 1949. St. V. St. Vincent Bill. Expressions "Germany enemy debt", "German Enemy Property" "German national ", "Germany ", "property" based on definitions in section 8(1) of G.E.P.A. "relevant time" see "trade debt" see S. I. 3 Clause 3 St. V.
4 Clause 4 St. V.
See Secretary of State's Circular Saving telegram No. 474/54 of 20th May, Distribution of German Enemy Property. No, of 1956, Currency Act (An endinent). An Ordinance to amend the Currency Act, 1950. ENACTED by the Legislature of the Colony of Antigua as follows :1. This Ordinance may be cited as the Currency Act (Amendment) Ordinance, 1956, and hall be read as one with the Currency Act, 1950, as amended, hereinafter called the Principal Ordinance. 2. After section 7 of the Principal Ordinance the following section to be numbered 7A shall be inserted. L. Is. Acts 4/1950, 1/1951, 20/1955. New section 7A added to Principal Ordinance. Board may issue currency notes to value of securities of participating Governments held by it. ANTIGtIA. 2 Ourrency Act (Amendment) No. Vo of 1956. Currency Act (Amendment). (b) a proportion of the Fund shall be held in London in liquid form and such proportion may be determined and varied from time to time with the approval of the Secretary of State by the Board." inserting immediately after the word "Conference" Ordinance. 'the words "as modified with the approval of the Governrneuts of the respective Colonies comprising the Eastern Group of the British Caribbean Colonies"
6. This Ordinance shall not come into Commnc. operation unless and until the Governor notifies ment, by proclamition that it is Her Majesty's pleasure not to disallow the same and thereafter it shall come into operation upon such day as the Governor shall notify by the same or any other proclamation published in the Gazette. Passed the Legislative Council this day of 1956. Under the present provisions of the Currency Act no part of the Currency Fund, maintained by the Currency Board for meeting the redemption of currency issued by the Board, may be invested in sterling securities of or guaraA teed by the Governments of any of the territories participating in the unified system of currency operated by the board. 2. The Governments of the territories concerned and the Secretary of State have agreed, however, that there is no longer any objection to the investment, within prescribed limits, of a part of the Currency Fund in such local securities. 3. This Bill seeks therefore to amend the Currency Act so as to permit such investment up to a limit of two million five hundred thousand pounds, which represented twenty per cent. of the monies in the Currency Fund at the 31st December, 1954. This amount may however be revised from time to time by joint action of the Governors of the territories concerned, with the approval of the Secretary of State. 4. Broadly speaking these steps are designed to enable a suitable proportion of the currency backing to be invested in loans raised locally to finance development projects, while at the same time preserving public confidence in the currency itself. by EARL PtuOTT, Acting governmentt Printer-By Authority. No. of 1956. Interlreiation and General Clau, ses (Amendment). ENACTED by the Legislature of the Colony of Antigua as follows:1. This Ordinance may be cited as the Short title. Interpretation and General Clauses Act (Amendment) Ordinance, 1956 and shall be read as one with the Interpretation and General Clauses Act, L. Is. Ac 1955, as amended, hereinafter called the Principal "211955, Act. S.t. & 0. Insertion of subsection (3) of section 2 of the Principa Act. NI'TIGUA. 2 Interpretation and General No. of I O5. pears, save as otherwise expressly provided or implied in such Act, or Ordinance, that; expression shall be taken to include the officer for the time being administering the government of the Colony." effect as from the 1st day of July, 1956. No. 'of 1958. Interpretation and General 3 ANTIGrA. Prior to the 1st day of July, 1956, by virtue of the ,definition of the expression "Governor" in the Interpretation of Laws Act, 1896, as amended, tile powers and duties vested in the Governor under Presidential Ordinances were exercisable by the officer for the time being administering the government of the Presidency. 2. By virtue of the delegation by the Governor to the Administrator under the Delegation of Powers Act, 1937, the powers and duties vested in the Governor which were specified in the Schedule to S.R. & 0. 1954, No. 26 were exercisable by the Administrator. 3. As a result of the repeal of the Interpretation of Laws Act, 1896 and its amendments (which became effective on the 1st day of July, 1956) and of the definition of Governor" contained in the Interpretation and General Clauses Act, 1955 (which, as amended by the Adaptation of Laws Regulations, 1956, has, as from the 1st July, 1956, become the Interpretation of Laws legislation in force in the Colony) the powers and duties mentioned in the preceding paragraphs can no longer be exercised by the Administrator. 4. 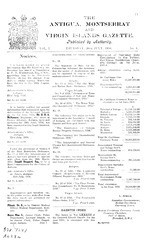 The object of this Bill is to extend the definition of "Governor" to include the officer administering the Government of the Colony in all legislation having effect on the 1st July, 1956, excepting the Police Act, 1951, as amended, and the Antigua Constitution and Elections Ordinance, 1952 and any other legislation where it is clearly intended that references to the Governor" shall be construed to nean the Governor of the Leeward Islands. Made by the Governor in Council this 10th day of July, 1956. F. A. CLARKE, Clerk of the Council. by EARL PIGOTT, Actina Governent Printer. -By Authority. 1956, DATED JULY 17, 1956, MADE BY THE GOVERNOR IN COUNCIL. UNDER SECTION 15 OF THE PLANT PROTECTION ORDINANCE, 1941 (No. 14 of 1941). Plant Protection (Amendment No. 2) Regulations, 1956, and shall be read as one with the Plant Protection Regulations 1951 (S. R. & O. 1951, No. 5) as amended, hereinafter called the Principal Regulations. by EAnfRL P1i', Acting (-ovwrinment Printer.--By Authority. A. 40/83-500-7.56. I rice 3 cents.